Turkey Union of Chambers and Commodity Exchanges Union of Chambers and Britain conducted since 2001 as well as from 30 June 2005, in cooperation with Turkish Lloyd Foundation with the purpose of continuing Room Improvement Program; The room and the placement of quality consciousness among the Exchanges, to increase the types of services, improving service quality, ensuring the convergence of room systems, and thus the Turkish Chambers / Exchanges system of European Chambers / Exchanges is to ensure the compliance of the system. 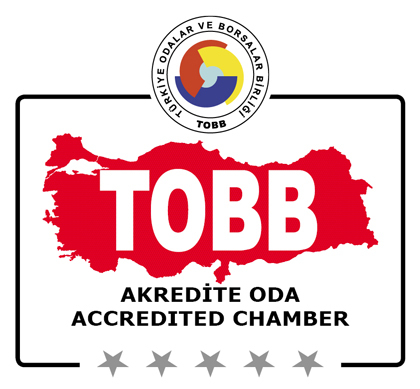 In this context; Antakya Chamber of Commerce and Industry on 26 July 2006 submitted an application to the Assembly Secretariat TOBB Accreditation Accreditation for the room. After the application Turkey after Chambers and Commodity Exchanges of Turkey and the Turkish Lloyd Foundation audit services performed in our rooms with the cooperation, of 4 May 2007 Chamber is accredited and Antakya Chamber of Commerce and Industry in Turkey took place accredited first 53 Chamber-Exchange in. In the November 5, 2007, Turkey Chambers and Commodity Exchanges of the certificate ceremony in the European Union, our Chamber Chairman Hikmet Cinçin is given Accreditation Certificate by Turkey Chambers and Chairman of the Union of Commodity Exchanges Rifat HİSARCIKLIOĞLU. Antakya Chamber of Commerce’s quality of service, continues to carry out work to keep the equivalent level with that of the European Chamber of Commerce. ISO 9001: 2008 Quality Management Standard; Starting from the production of a product or service delivery, as far as it reaches the customer service in every process is a standard that met under the quality assurance of customer expectations and requirements. A company or organization, ISO 9001: 2008 Quality Management System establish and the ISO 9001: 2008 Quality Management Certificate is entitled to receive it is guaranteed to be assured of the quality of service companies or institutions. With this awareness, Antakya Chamber of Commerce and Industry as the first, on 30 December 2005 has received the Registration Certificate ISO 9001: 2000 on Quality Management System. Our Chamber that meet customer demands in terms of the legislation and in force that allows services in a regular basis and certifies the competence in these matters. Our quality management system, by meeting customer requirements is being developed in order to increase customer satisfaction, sense of duty and working principles of our room, our Quality Policy is defined in the framework. About Antakya Chamber of Commerce Protection of Trademarks the right to use the name according to the Decree Law No. 556 as of 30.12.2013 it was registered on 22.08.2014 a period DECADE. Antakya Chamber of Commerce and Industry submission made on 14.04.2006 to Antakya Künefe Geographic Markup was announced in the Official Gazette dated 27.12.2007 date and number 26 739. No. 555 Antakya Center and its Settlements to be effective in the Law on the Protection of Geographical Indications from the date of 14.04.2006 in accordance with Article 12 of the decree has been registered in this municipality.